DENHAM SPRINGS- After repairing millions of dollars in flood damages, Abundant Life Church is celebrating its grand reopening. It took the church 18 months to get back into their chapel called "the dome," and tonight is not only a celebration, but a rebirth. With every building touched by high water, the 2016 flood hit the place of worship hard. "The church was totally flooded. Mud was everywhere," Pastor Greg Beatty told WBRZ. "My heart just sank, when I walked in the building that morning and the first thing you ask yourself is man, what am I going to do?" More than four feet of water washed through the church, causing over $3 million in damages. The entire interior had to be renovated. 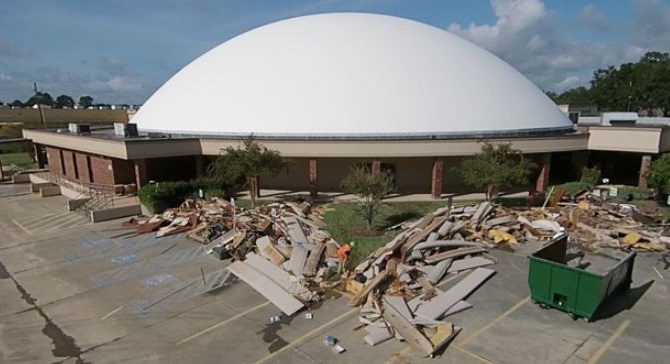 "Down by our stage where the floor slopes, we had over seven feet of water, we had catfish swimming down the front of our stage at our church, so you can imagine the damage that a flood would do to over 65,000 square feet of facility," Pastor Beatty said. And church members were devastated. "To see everything destroyed here, and the memories, it was just heart breaking," one member told News 2. The insurance was not enough to cover even half of the damages, so members donated money out of their own pockets to reconstruct the building. Another church member says, "We know that there's nothing torn down that's not ever rebuilt bigger and better." Now, they're worshipping in the all new and revived Abundant Life Church. The first official post-flood service will be held next Sunday, March 18.